Join me on this tasty & creative morning tour in one of the most emblematic districts of Madrid - the Literary quarter, or as the locals call it -Barrio de las Letras. On this tour I will take you to an iconic part of Madrid, where the most important Spanish writers (Cervantes, Lope de Vega, Quevedo and more) lived. You will see what inspired these great minds to write some of the most famous Spanish literary pieces. Of course the art goes hand in hand with a little bohemia and in this neighbourhood we will visit the most authentic and traditional shops and bars with history centuries long. You will enjoy stepping into locals-only markets, tasting the production and with my help chatting with the vendors; I will also recommend what souvenirs to bring back from Madrid. During this experience you will learn about Spanish culture and the how the Golden Age inspired Madrid’s artists. You will tour the streets and many venues off the beaten tourist tracks. 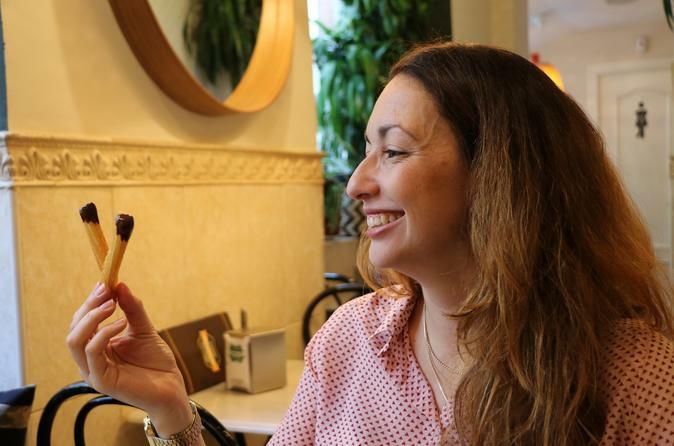 You will taste some of most delicious products of Spain and you will never forget the taste of best Churros with chocolate. Book this tour on your first days of arrival in Madrid and you will receive manytips for your stay in Sapnish capital.